In a great showdown that went down to the wire, Brose Baskets Bamberg improved to 2-1 in Group B by edging previously undefeated Anadolu Efes Istanbul 88-86 at home on Friday. Casey Jacobsen paced the winners with 23 points on 7-of-10 three-point shooting, including one that won it for Bamberg with 1.3 seconds remaining. Anton Gavel added 17 points, Jamar Smith scored 14 and John Goldsberry dished 8 assists for Bamberg. 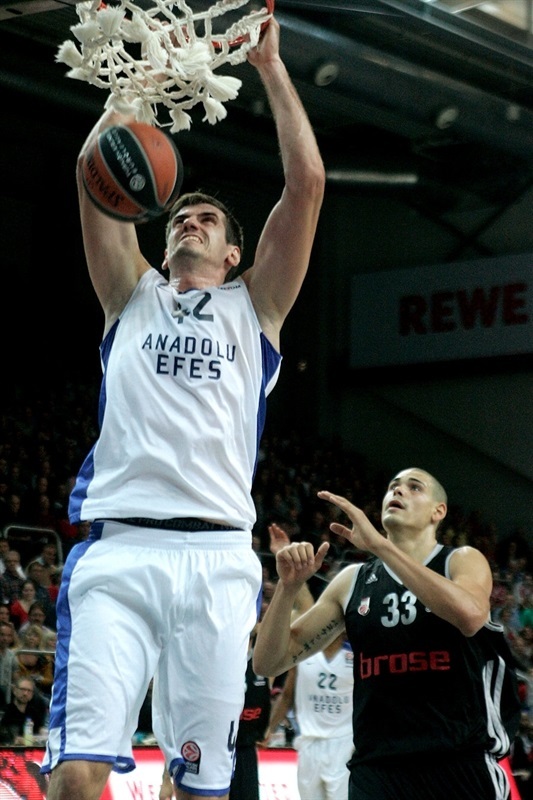 Dusko Savanovic led Efes with 17 points. Jamon Gordon and Scotty Hopson each scored 14 and Semih Erden recorded 7 blocks, the most by any player in the Turkish Airlines Euroleague since 2008. Jacobsen hit three early triples to give Bamberg a double-digit lead, 16-6. 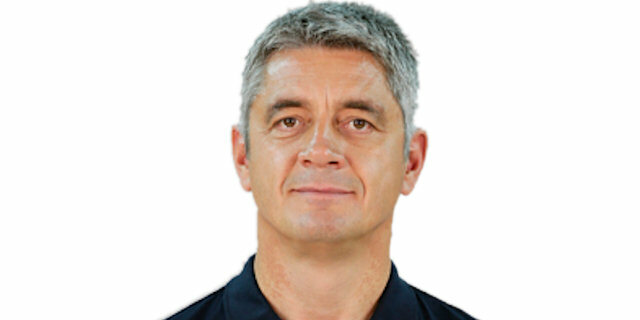 Zoran Planinic and Gordon, however, allowed Efes to move ahead a 23-24 after 10 minutes. Efes kept finding good options on offense - 15-of-21 two-point shots, 5-of-7 three-pointers before halftime -, as Savanovic, Hopson and Stanko Barac helped the guests take a 44-51 lead at the break. 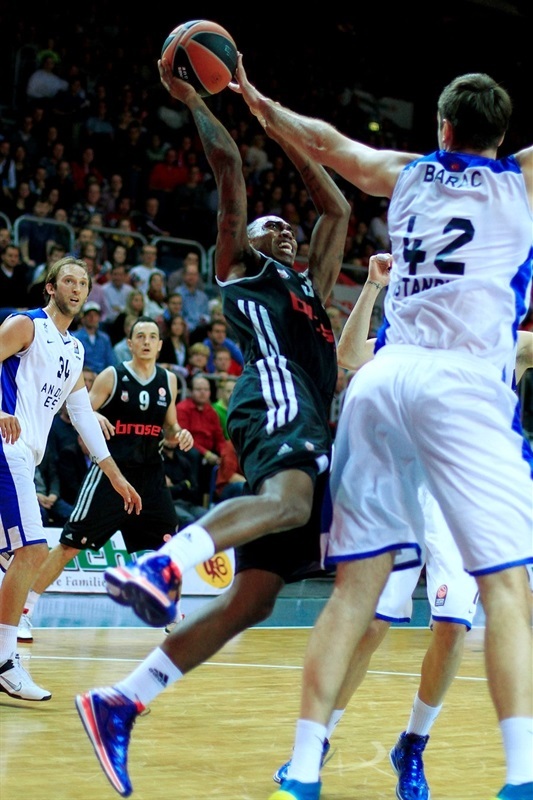 Efes extended its margin to 52-66 midway through the third quarter, but Bamberg was not done. Back-to-back three-pointers by Jacobsen ignited a 20-2 run that Smith capped with a close basket for a 70-66 Bamberg lead with nine minutes to go. 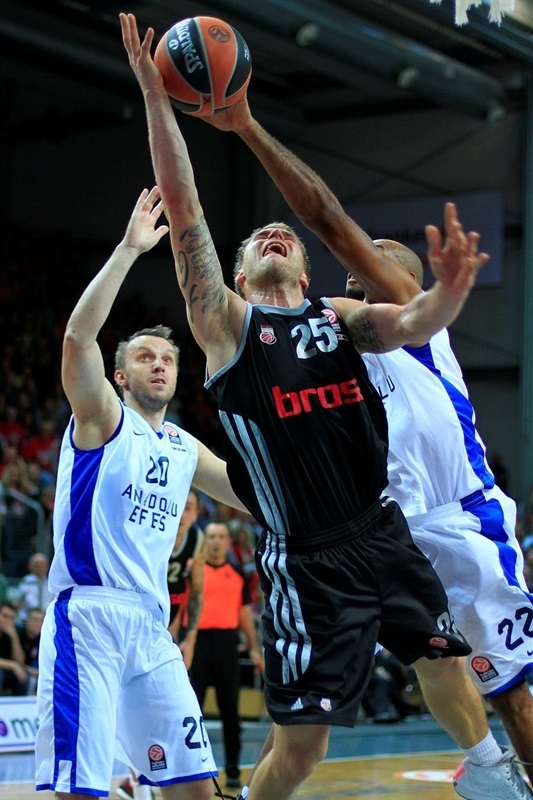 Bamberg extended its margin to 84-77, but Kostas Vasileiadis singlehandedly brought Efes back to life. It all came down to the final minute. A jumper by Gordon gave Efes an 85-86 lead with 6.8 seconds left. Bamberg called timeout and Jacobsen rounded out his near-perfect game with the game-winning shot in the next-to-last second. Damir Markota got Bamberg going with a four-meter jumper that Planinic erased with a big basket in the low post. Casey Jacobsen hit a running triple. After Erden dunked, a baseline jumper by Goldsberry gave the hosts a 7-4 lead. Scotty Hopson swished a mid-range shot, which Anton Gavel bettered with a bomb from downtown. A red-hot Jacobsen hit another three-pointer, and then another one to boost his team's lead to double digits, 16-6, after a 9-0 run. Gordon scored around the basket off a timeout and a coast-to-coast layup by Savanovic brought Efes a bit closer, 16-10. Erden stepped up with a second-chance layup. Gordon scored again and a three-pointer by Planinic allowed Efes to get its first lead, 16-17, after an 0-11 run. Smith sank a jumper and exchanged triples with Birkan Batuk. Savanovic made free throws and Gordon copied him right after that, before Zack Wright brought the hosts within 23-24 after 10 minutes. Batuk pushed Efes with a driving basket early in the second quarter. Philipp Neumann scored around the basket, but Barac erased that with his trademark mid-range jumper. Smith downed a three-pointer in transition and soon added free throws to put Bamberg back ahead, 30-28. Hopson returned to the floor and immediately delivered with a layup which Barac followed with a jumper for a 30-32 Efes edge. Vasileiadis and Gavel traded triples before Barac split foul shots and Jacobsen struck from downtown to allow Bamberg to regain the lead, 36-35. Tadija Dragicevic joined the three-point shootout and a dunk by Maik Zirbes tied it, 38-38. Planinic split foul shots, Barac dunked and a three-pointer by Savanovic caused Bamberg to call timeout at 38-44. Vasileiadis fed Hopson for a big slam that Zirbes matched with a put-back basket. Hopson swished a turnaround jumper, but Wright followed a one-handed floater with free throws. Savanovic downed another three-pointer that fixed the halftime score at 44-51. Erden scored down low immediately after the break and another three-pointer by Savanovic gave Efes its first double-digit lead, 44-56. Gavel quickly answered from downtown, but Gordon nailed a six-meter shot for a 47-58 score. Sharrod Ford split free throws, Gordon and Neumann traded layups and Savanovic banked in a running shot to cause Bamberg to call timeout at 50-62. Hopson nailed a six-meter jumper and matched Ford's two-handed dunk with another mid-range shot, good for a 52-66 Efes lead. Jacobsen beat the shot clock with a wild, seven-meter bomb and Ford got the crowd involved with a high-flying block on Savanovic. 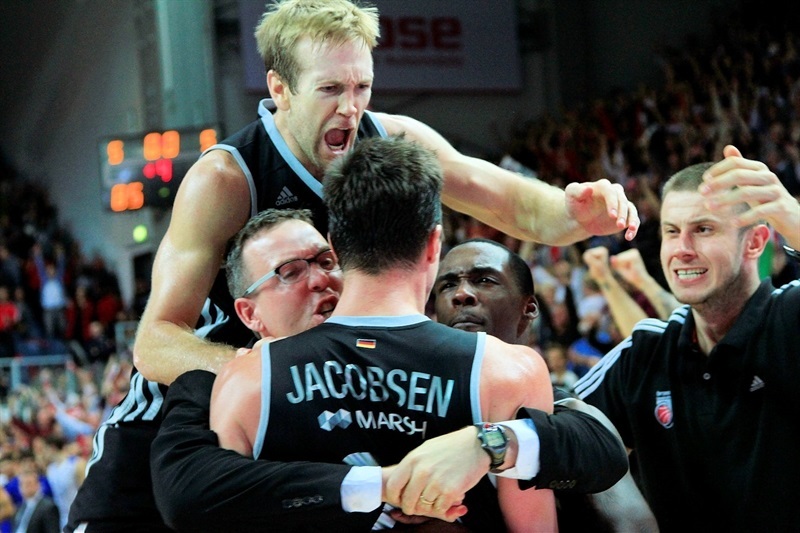 Smith nailed a long jumper and Jacobsen struck from downtown to bring Bamberg back to life, 60-66. Ford scored down low to cap a 10-0 run, as Dragicevic stepped up with a driving basket. Jacobsen sank free throws and jumper by Rakim Sanders made it a two-point game, 66-68. Ford scored again and free throws by Wright completed Bamberg's comeback, 70-68, at the end of the third quarter. Smith capped a wild 20-2 run with a close basket early in the fourth quarter, good for a 72-68 Bamberg lead. Efes had been scoreless for more than four minutes until Hopson stepped up with free throws. Savanovic soon tied the game, 72-72, with seven minutes left. Zirbes scored around the basket, but Gordon found space for an uncontested layup. Gavel hit a stop-and-pop jumper in the lane, Erden split free throws and Planinic put Efes back ahead, 76-77, with over four minutes left. Gavel finished a three-chance Bamberg offense with 3-of-3 free throws and soon added a critical three-pointer that forced Efes to stop the game at 82-77. Bamberg kept powering the offensive boards and a jumper by Zirbes made it a 7-point game. Efes found a go-to guy in Vasileiadis, who made 4 free throws and struck from downtown to tie the game, 84-84, with 1:18 left. Zirbes split foul shots, Gordon missed a jumper, but collected a steal that allowed Efes to get the ball back with 20 seconds to go. Gordon downed an off-balance shot with 6.8 seconds remaining, but Bamberg called timeout and Jacobsen buried the game-winning shot with 1.3 seconds to go. Hopson missed a desperation shot from way downtown, allowing the Bamberg fans to celebrate a big win. "The game went up and down, for sure it was a game of runs. I thought our energy in that third quarter kind of brought us back to life. It was great that Casey had the ball in his hands at the end – he is a guy that deserves more than any other, to win this buzzer beater after a couple of bad ones that we have seen in the last couple of years. So I feel good about that win." "We started the game weak defensively and we tried to recover and played 25 very good minutes. 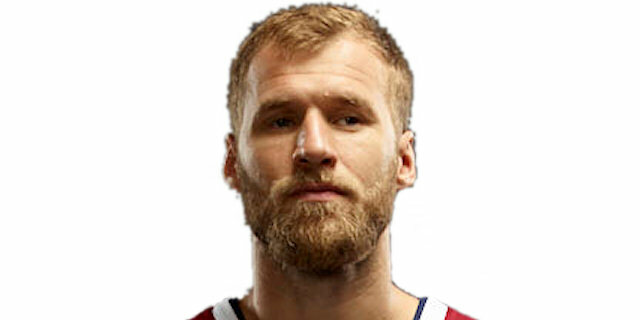 But I think this is a problem that we are showing at several games, that we don’t have enough maturity during the game. That we give away momentum. After that, in the last quarter we came back, and we were very close. We had the last possession, but we made a lot of mistakes for this level, a lot of defensive mistakes, and we allowed more offensive rebounds than we took. That is impossible to accept. That was one of the crucial parts of the game." "It was an unbelievable game until the end – Casey made an amazing shot and we won the game – that’s it." 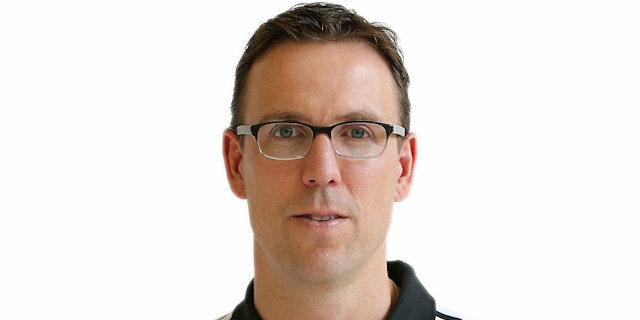 "It was a very difficult game, we played well until the third quarter. Then we had problems, we were leading by 12 points and we let Bamberg score 11 threes, open three-point shots. In the end, it was a game that can happen like this. It was unlucky, I think we played a very good game, but in that crucial moment we lost that game."